Carty and Brown were motivated by "greed"
Two men who were convicted of stabbing a City lawyer to death during a mugging have been jailed for life. 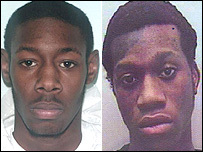 Donnel Carty, 19, received 21 years and Delano Brown, 18, was given 17 years as minimum terms at the Old Bailey. Tom ap Rhys Pryce, 31, was stabbed twice in the chest in Kensal Green, north-west London, in January. In a statement read to the court, Mr ap Rhys Pryce's fiancee, Adele Eastman, 32, spoke of her "absolute devastation" at his murder. She said: "In a matter of seconds wedding plans and a future together had changed to funeral plans and a lifetime apart." Carty and Brown were convicted on Monday after a three-week trial at the Old Bailey. Lawyers read the victim impact statement from Ms Eastman before the two men, from Sudbury Hill, were sentenced. After the verdicts were announced, Mr ap Rhys Pryce's parents said their son's death "was a callous and senseless crime which has devastated the lives of his family, his fiancee and his friends". 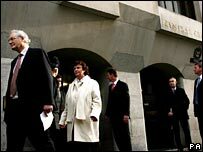 His father John ap Rhys Pryce said: "Sadly nothing can bring Tom back but we are pleased and grateful that justice has been done." Urging youths not to carry knives, he added: "We hope that the sentences handed down today... will send a message to other youths who habitually carry knives. "As [the England footballer] Rio Ferdinand said yesterday, 'knives are not cool', and we must get this message across. "It's imperative that we stamp out this current knife culture in our cities." Carty and Brown sat calmly, just a few feet away from Mr ap Rhys Pryce's parents, as Mr Justice Aikens sentenced them to life. The judge said he could not tell who wielded the knife but considered Carty and Brown equally guilty. He added: "Mr ap Rhys Pryce had the grave misfortune to be in the wrong place at the wrong time. "He was true to his nature. He was not going to let two youths rob him in the street where he lived. He was stabbed with a knife. "That caused immense suffering. You have shown no remorse as yet. I can only hope that in the future you will have some glimpse of how dreadful your crime was and the suffering you have caused." During the trial, jurors heard Mr ap Rhys Pryce was walking home from Kensal Green Tube station at about 2300 GMT when he was attacked. Carty and Brown, who robbed chef Kurshid Ali at Kensal Green Tube station 30 minutes earlier, were part of a gang that mugged 10 people on the London Underground in the weeks before Mr ap Rhys Pryce's murder. The defendants had earlier pleaded guilty to robbery.